I am sure I am not the only one exhausted by the political ups, downs, turns, and about changes in the first fifteen weeks of 2019. That scenario is probably familiar to many of you and is a brilliant example of how well-intentioned medical professionals commonly use words with the assumption that their meaning is well known, while their perfectly capable patients (Michael Katz is a successful marketing consultant and author) nod their heads with evident, but unanswered questions. Vital signs measure the body functions most necessary to sustain life: your ability to circulate blood throughout your body, your ability to adequately oxygenate that blood, and your ability to maintain a body temperature that allows the maximum function of all your organs and organ systems. The measurements include Pulse, Respiratory Rate, Body Temperature, and Blood Pressure. I will give a brief primer on all four- but will start with Michael’s question first. I am sure most of you know what your blood pressure is, or at least if it is high, low, or (to quote Goldilocks) just right. But what do those two numbers reflect? What are they measuring? The First Number = Systolic Pressure: When your heart contracts (specifically your left ventricle) to send blood through your body, it requires a certain amount of force to do that. Your Systolic pressure is the amount (in mm of mercury) of pressure against your arteries exerted by your heart. The Second Number = Diastolic Pressure: This is the resting pressure of your blood on your arteries in between beats when your heart is filling. Think of this as a closed system of hoses run by a pump (which it is). An obstruction in the peripheral line (such as atherosclerosis or plaque buildup) will cause both numbers to rise- there is more pressure needed to get the blood distributed, and the fluid exerts more pressure against the walls between beats. Alternatively, if those numbers fall, it indicates either a leak in the system (hemorrhage) or the size of the “hose” has increased in volume (such as a sudden dilation of your vascular system in septic shock). 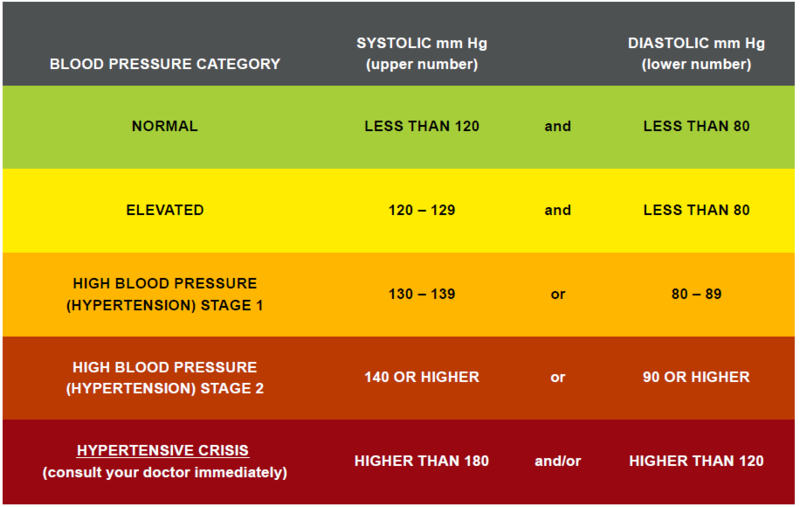 It is important to note that the chart (and associated webpage) was updated in December 2017 after a new definition of an elevated blood pressure was set at anything over 120/80. The implication of this new limit is the number of Americans with high blood pressure went from 32% of the population to 46%. That could very likely include you. I will let you discuss the implications of this change in the exam room with your own provider, but if you want to know more before your next office visit see these articles from Science News, NBC news, the New York Times, or Consumer Reports. Your pulse is how often your heart beats in a minute, but much more. When someone is checking your pulse, they are also discerning qualities of your heartbeat. Is it weak or pounding? Thin and “reedy” or racing? Is it regular or irregular? You have many places in your body where an artery is close enough to your skin and in a position where finding a pulse is optimum. Most commonly that is at your wrist, but your neck and the top of your feet are also common options. checking your pulse on the top of your feet (your pedal pulse) is an indicator that your blood is flowing without difficulty to the farthest reaches of your body. What is a healthy pulse to have? The average resting pulse for adults is 60 to 100 beats per minute (bpm), although gender and age may change that slightly, and exercise will (should!) raise it above that rate. To learn more about your pulse and how to take it, go to the American Heart Association’s page “All About Heart Rate” here, or information from the Mayo Clinic here. I also like this YouTube video demonstrating how to take your pulse from Mahalo.com. One more thing, children have a faster pulse– here is a resource for learning more about how to take your child’s pulse and what range is considered average for their age. Not too much to say about respirations- we all know breathing is recommended. But how much is too much- or not enough? Adults at rest normally breath between 12 and 20 times a minute, a rate below 12 or higher than 25 (minus exercise or other natural causes for a temporary increase) is abnormal. Again, children will be faster. Quality is also part of measuring breaths– are they labored, equal on both sides of the chest, accompanied by wheezing or clicking/popping sounds? For more on those differences (complete with audio examples!) go here. Have you ever wondered how anyone even knows what your respiratory rate is? Have you ever caught anyone counting? Here is a tip: When the nurse is taking your pulse (which seems like forever!) half that time they are only pretending to count your pulse- they are actually peeking at your chest to count your breaths too. This may ruin the medical office trick- but it is fun to know. The most common confusion about body temperature is when the number means you (or your child) has a fever. Because of these inconsistencies, you should always include how a temperature was taken when you are talking to a nurse or doctor. For more explanation, directions on the best way to take your child’s temperature, and normal temperatures in Centigrade go to WebMD here. There is a helpful pediatric chart of normal temperatures and all the other vital signs in children here. And then start asking questions. A shout-out to my friend, colleague and consultant Michael Katz for allowing me to share his question so publicly. Under the guise of “The Likeable Expert,” he assists solo professionals of all industries. He is, in truth, enormously likable and undoubtedly an expert. To find Michael and learn more about how he can help in your marketing endeavors (as well as subscribing to his entertaining and informative newsletter) go here. 2. If you have been anywhere near a TV, radio, gym or Doctor’s office in the last four (five?) decades you know that cardiac (heart) health is critical, but it never hurts to be reminded. There is a list of ten things you can do to improve your health from the Mayo Clinic (with explanations and tips at this link), ten tips from WebMD, ten steps from Harvard Health (ten seems to be a favorite number! ), and the American Heart Association’s diet and lifestyle recommendations. 3. And for the wonkiest among you: You can test yourself with 59 flashcards on vital signs here. "As a speaker Sarah provides thorough, timely, and practical information on difficult issues in the practice of medicine, and has been consistently rated as one of TMA’s top speakers by our physician and medical office staff audiences. Her dynamic presentation skills shine in all settings including intimate workshops, keynote addresses, panel discussion, and audio conferences and webinars." 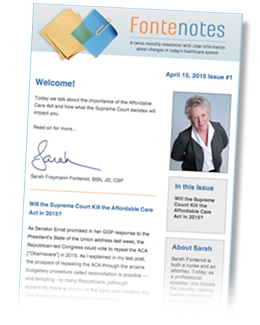 I am proud to have Fontenotes republished by several professional organizations as a benefit for their members. If you are interested in distributing this content in your journal or newsletter, please contact me. © 2019 Sarah Freymann Fontenot. All Rights Reserved.